THE M-20 AIRWAVE™ – THE “KING” OF SNOWMOBILE SUSPENSIONS” – SIMPLY EATS UP UGLY, ROUGH TRAILS AND CANNOT BE COMPARED TO ANY OTHER SLED OR SUSPENSION OUT THERE! With a single simple air adjustment at the rear tuning your ride has never been easier! No production or aftermarket suspension can begin to deliver SUCH breadth in operating range. Typically when you tune a production snowmobile suspension for big bumps, they’re stiff in the medium and small. If they are calibrated in the middle then their ride falls short on both ends. The M-20™ bridges it all—such breadth! The M-20 AIRWAVE™ will truly transform the sled you like—into the sled you love. This season choose proven, reliable speed and comfort over bold new promises and claims by Arctic, Polaris, Ski-Doo or Yamaha. You've heard it all before. 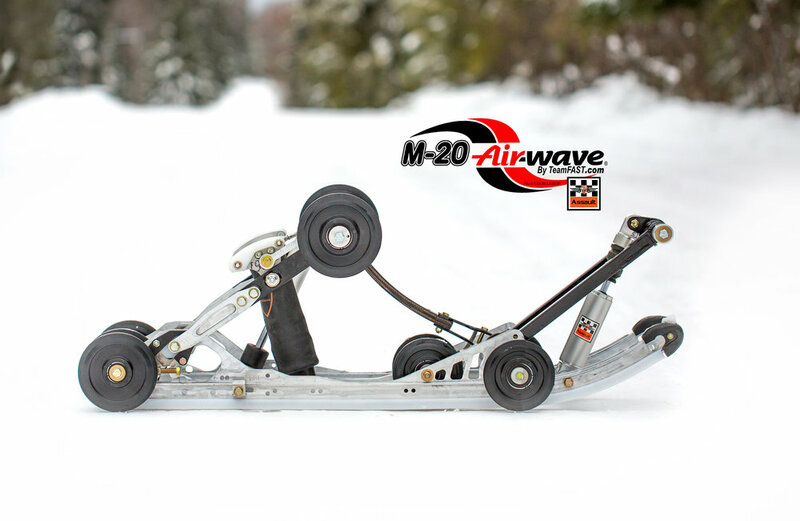 M-20 airwave™ — the “KING”— BEST SNOWMOBILE SUSPENSION EVER MADE!